Last year I started playing around with the Solid platform, introduced by Tim Berners-Lee. 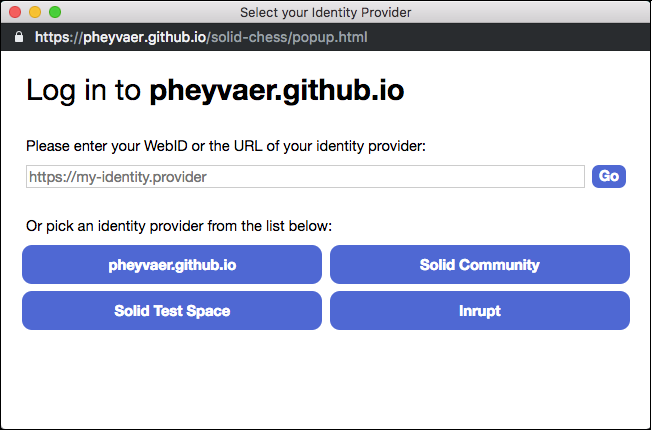 In order to get more familiar with the different concepts and technologies used, I created a proof-of-concept app: a browser chess game. The main concept of the Solid platform is the use of Solid PODs, which provide personal online data storage. The idea of Solid is that a user has one or more PODs to store their data and different apps are able to interact with these PODs, but these apps can only read and write the data to which the user has granted them access. So, instead of having to store all data of all users on a single server per app, users now store and control (!) their own data, leading to a decentralized approach. The focus of this blog post is on the interaction between the app and the Solid PODs. First, we list the different features of the chess app. Second, we elaborate on the three high-level components of the app. Third, we list the different steps that are taken when certain actions are done by a player. Finally, we discuss how the data generated by this app can be used by other apps. The app consists of three high-level components: the GUI, the chess game engine, and the interaction with the POD. The GUI uses the chessboard.js library, which offers the chessboard and the interaction of the players with the board, such as the moving of the pieces. It does not provide a chess engine, i.e., it will not check whether the moves are valid or not and keep track of which player’s turn it is. To accomplish this we make use of the chess.js library. Although it provides the required information to play a chess game, the data is not presented as Linked Data, which is preferred by the Solid platform. Linked Data is a method of publishing structured data so that it can be interlinked and become more useful through semantic queries. Therefore, I created a “wrapper” library around chess.js called semantic-chess that outputs RDF, a technology used to materialize Linked Data, which can be used during the interaction of the app with the POD. The focus of this blog post is on this interaction. When the app is launched, one of the first actions a player does is logging in. For this we use the solid-auth-client library. It keeps track of the session and provides a fetch method that is used whenever we want to interact with the POD. Whenever a player is logged in the fetch method is able to store and read data from PODs to which the logged-in player has access. Figure 1: pop-up window that appears when clicking the “Log in” button in the app. In the GUI there is a classic log-in button. When clicked, a pop-up appears that allows selecting your identify provider to which you want to authenticate (see Figure 1). You can provide your own HTML file to render the pop-up or you can use the default one provided by the library. After successfully logging in, the pop-up is closed and the focus is back on the app. The solid-auth-client library has tracked the fact that a player has logged in and now a session object is available. This session object contains, for example, the Web ID of the logged in player. A Web ID is an HTTP URI that denotes an agent on an HTTP-based network. In line with the Linked Data principles, when a Web ID is de-referenced, it resolves to a profile document that describes its referent, i.e., the player. Furthermore, the fetch method provided by the library will now act on behalf of the player. 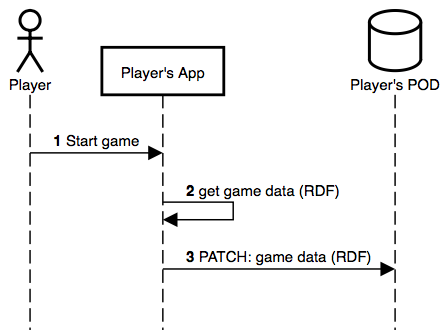 When a player starts a new game he needs to select an opponent, the app needs to store the game data on the player’s POD, and invite the opponent. 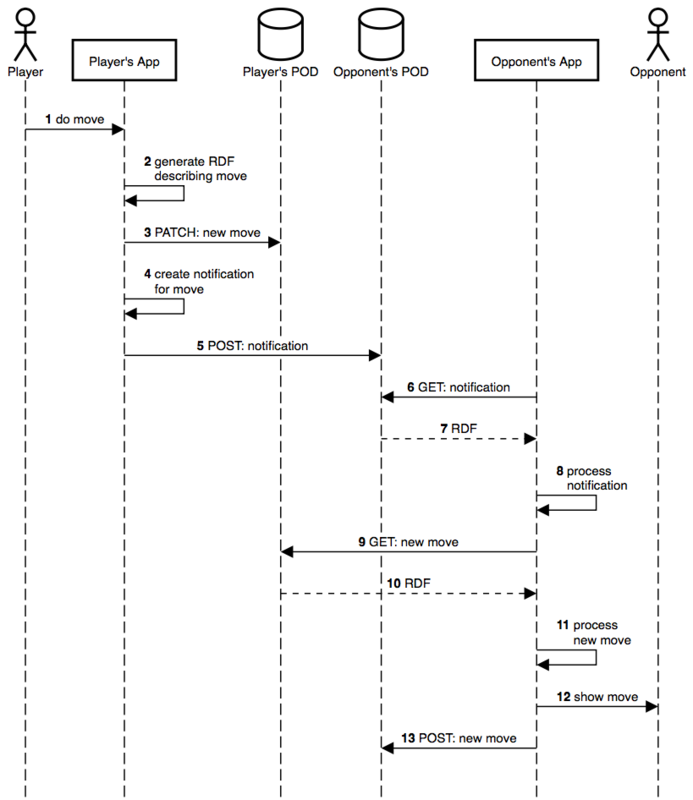 Figure 2: sequence diagram of the steps taken when a player selects an opponent. For every friend the following three steps are taken. The app shows a list of friends to the player. The player selects the desired friend as his opponent. SPARQL is used to query the RDF to find friends and their names, because it is the default query language for RDF. However, alternatives such as LDFlex and GraphQL-LD are also available. The FOAF ontology, with prefix foaf, is one of several ontologies, such as Schema.org and vCard, that can be used to describe the basic information of a person. At the time of writing, when creating a default profile with Solid mostly FOAF is used. However, bear in mind that other Solid PODs might use (a combination of) other ontologies. We only store the Web IDs of a player’s friends on the player’s POD, because additional information about a friend can be acquired by downloading data from the friend’s POD. 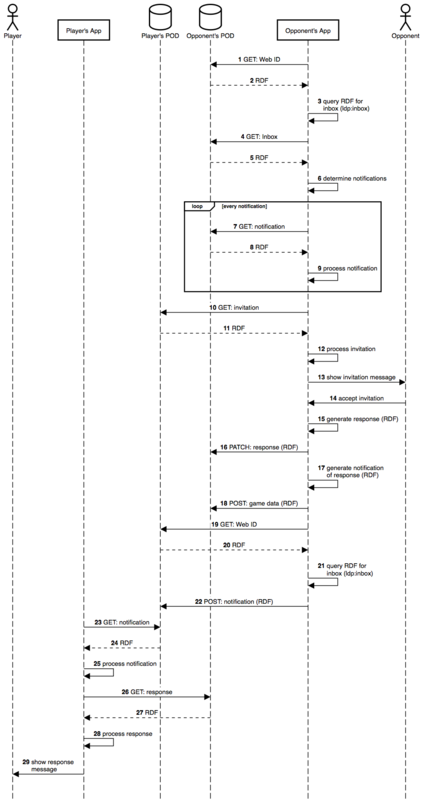 Figure 3: sequence diagram of the steps taken when storing game data on the POD. The player starts the game. Figure 4: sequence diagram of the steps taken when an opponent is invited. The player’s app does a POST to the inbox with the notification of the invitation. When we do a POST to an inbox a new file, containing the notification, is created in the inbox. Figure 5: sequence diagram of the steps taken when an opponent joins a game. The opponent’s app does a GET to the Web ID of the the logged-in user, which in this case is the opponent. The opponent’s app does a GET to the inbox, which contains links that identify the different notifications. The opponent’s app iterates over all notifications in the inbox. The opponent’s app does a GET to the link of the notification. If the notification contains an invitation, the opponent’s app does a GET to the link of the invitation. The opponent’s app shows the invitation to the opponent. The opponent accepts the invitation. 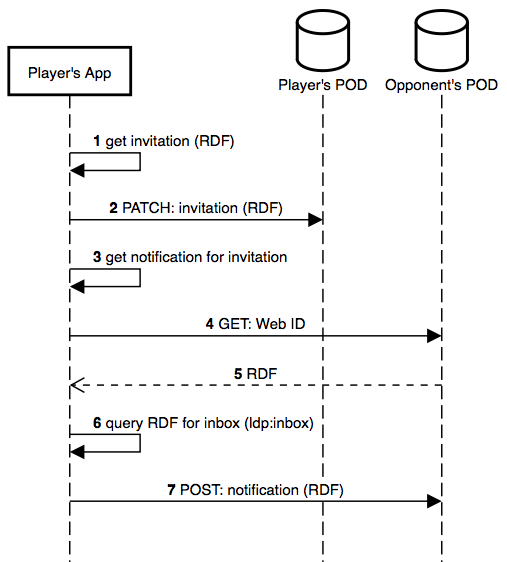 The opponent’s app does a PATCH to the opponent’s POD to store the relevant game data. This is mostly data to know later that the opponent is participating in the game. Details about the game are not stored on the opponent’s POD, because they are stored on the player’s POD and are retrievable by doing a GET to the link of the game. The opponent’s app does a GET to the Web ID of the player. This Web ID is available through the invitation. The app queries the RDF to determine the player’s inbox via the predicate ldp:inbox. The app does a POST to the player’s inbox with notification of the response. The player’s app does a GET to the notification. For clarity we skip the iteration over the different notifications, because this is the same as earlier. The player’s app queries the RDF to determine if the notification contains a response, via the class schema:RsvpAction. If the notification contains a response, the app does a GET to the link of the response. The player’s app shows the response to the player. Figure 6: sequence diagram of the steps taken when a player does a move. The player does a move. chess:resultingPosition "rnbqkbnr/pppp1ppp/4p3/8/8/4P3/PPPP1PPP/RNBQKBNR w KQkq -". is the link of the previous move. The player’s app does a PATCH to the player’s POD to store the move. The player’s app does a POST to the opponent’s POD with this notification. The opponent’s app queries the RDF to determine if the notification contains a move. The opponent’s app does a GET to the link of the move. The opponent’s app shows the new move to the opponent. The opponent’s app stores the link of the new move on the opponent’s POD. This is done to reconstruct the chess game based on the sequence of individual moves. 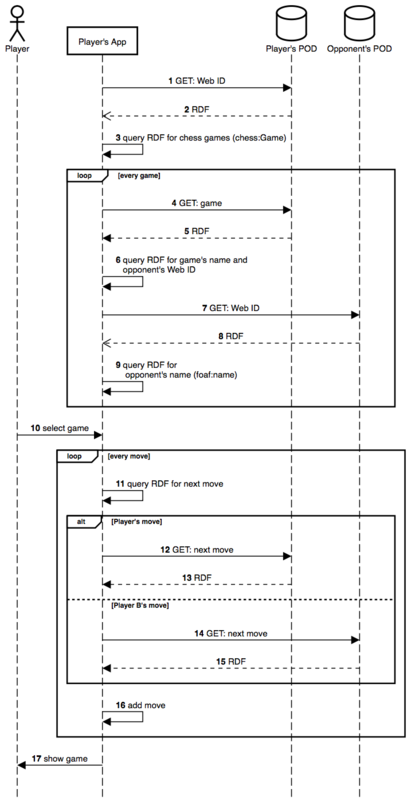 Figure 7: sequence diagram of the steps taken when a player continues a game. The player’s app does a GET to the player’s Web ID. 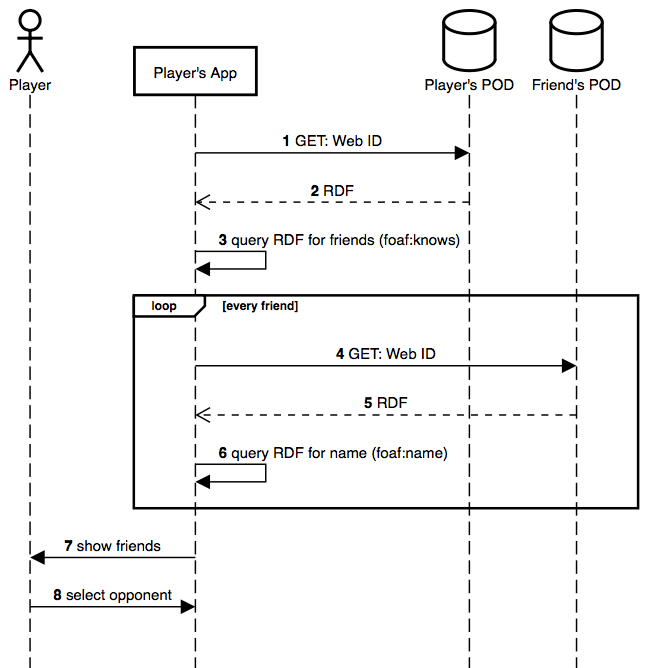 The player’s app queries the RDF to determine the chess games in which the player participates. The app iterates over all games. The player’s app does a GET to the link of each game. The player’s app does a GET to the opponent’s Web ID. The player selects the game he wants to continue. The player’s app iterates over all moves of the selected game. If the move is from the player then a GET to the link of the move by the player’s app goes to the player’s POD. If the move is from the opponent then a GET to the link of the move by the player’s app goes to the opponent’s POD. The player’s app adds the move to the instance of the game. The player’s app shows the game to the player. If you have any questions or remarks, don’t hesitate to contact me via email or via Twitter.